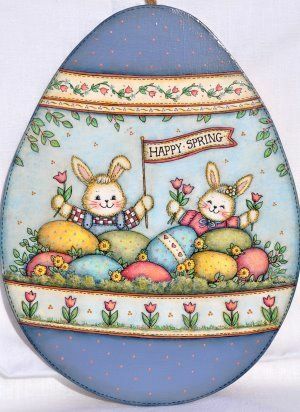 Featuring two happy bunnies holding tulips and a “Happy Spring” sign behind many colorful eggs and flowers. It is painted on an 8" x 10 1/2” egg shaped wooden plaque. This packet contains: Complete directions, three color photos and one full size pattern page.